An angel appears to the shepherds and tells them that the Savior has been born. UT ON THE streets of Nazareth the people were standing in groups, talking excitedly. News had just reached their city that the great emperor of Rome had commanded all of them to go to the town or city from which their families had come and have their names written on lists. The emperor wished to have a list of the names of all the people in this great kingdom, or empire. And no one dared to disobey his command. Soon travelers were seen going in every direction, for the emperor's command had been read in every city in the land. Out from Nazareth a company of people started toward the south, and in that company were Joseph and Mary, for they were both of the family of David, and they were going to Bethlehem, the city of David, to have their names written upon the list at that place. The road to the south led through the country of Samaria, then over the hills of Judah into Jerusalem. From Jerusalem Joseph and Mary went farther south, till they came to Bethlehem. Some of their company had left them in other cities along the way, while others had joined them. And when they reached Bethlehem they found that it was swarming with people who belonged, as they did, to the city where David was born. From every part of the land these people had come, and they had filled the lodging rooms till no more place could be found for the new arrivals. The long journey from Nazareth had been very tiresome, and Mary longed for a place to rest. But Joseph could find no place except in the stable of the inn. And here they stayed during their first days in Bethlehem. God had not forgotten his promise to Mary, and one night while she was in Bethlehem he gave her the child, Jesus. And Mary wrapped him in soft cloths called swaddling-clothes, and laid him in a manger where the cattle fed, because she could find no better place. The people of Bethlehem did not know that the angels were watching over the city that night. They did not hear the angels' glad song when Jesus was born. They did not see the joy of Mary and Joseph as they bent over the wonderful child in the manger. And so it was that God's greatest gift to men came right into that neighborhood and those people did not receive it as a gift from God because they did not expect a Savior to be born of such a humble person as Mary. But there were shepherds watching their flocks that night in a field near Bethlehem. Perhaps David, the shepherd king, had tended sheep in that same field many years before. These shepherds knew about David, and about God's promise to David that one of his descendants would be the Savior of men. And they may have been talking about God's promise when the angel of the Lord suddenly came near and a glorious light broke upon them through the darkness. 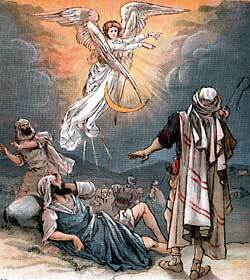 Trembling with fear, they looked upon the angel and wondered why he had come to them. Then he spoke, and said: "Fear not, for I bring you good tidings of great joy, which shall be to all people. For unto you is born this day in the city of David a Savior, which is Christ the lord.. And you will find the baby wrapped in swaddling-clothes and lying in a manger." What a wonderful message! The shepherds listened eagerly to the angel's words, and when he finished speaking they saw a multitude of angels join him and begin to sing. Such music this world had never heard, for the angels were singing one of heaven's glad songs, giving glory to God in the highest. And they also sang, "Peace on earth, good will toward men." When the song had ended, the angels went back into heaven and the glorious light faded again into the darkness of the still night. But the shepherds never forgot the sweetness of that song nor the joy it brought to their hearts. They did not wait until daylight to hasten to Bethlehem in search of the wonderful child, but said to each other just as soon as the angels disappeared, "Let us now go to Bethlehem and see this thing which the Lord has made known to us." So they left their flocks and hurried to Bethlehem, and there they found Mary and Joseph in the stable, with the infant Savior lying in the manger as the angel had said. The shepherds told Mary and Joseph about their angel visitors and about the wonderful song that the angels sang. And no doubt they knelt before the manger and worshiped the little babe who lay quietly sleeping in the hay. Then they ran into the streets of Bethlehem and told every one whom they met about the angel's visit and about the wonderful child who had been born that night in a stable of the city. And the people wondered about the strange things that the shepherds told. When the baby was eight days old, Joseph and Mary gave him a name, and they called him by the name the angel had chosen. That name, Jesus, means "salvation," and it told to men the work that God had sent this child to do. There was a law among the Jews that an offering should be made to the Lord for the first boy child born into each family. Among the rich people this offering should be lamb, but among the poor people the offering of only two young pigeons would please God just as well. When Jesus was forty days old Joseph and Mary took him to the temple at Jerusalem to give their offering to the Lord. They brought two pigeons, for they were poor and could not bring a lamb. An old man named Simeon was in the temple when Joseph and Mary came to bring their offering. This old man had served God for many years, and he longed to see the Savior whom God had promised to send into the world. God knew about this longing in Simeon's heart, and one day he spoke to Simeon and said, "You shall not die until you have seen the Savior." When Mary brought the baby Jesus to the temple, God's Spirit caused Simeon to know this child was the promised Savior. He came eagerly to meet Mary and took her babe in his arms. Then he said, "Now may God let me depart in peace, for I have seen with my eyes the salvation which he has sent." Another faithful servant of the Lord was in the temple that day, an old lady named Anna, who spoke words of prophecy to the people. When she saw Jesus, she too gave thanks to God, and to the people who stood in the courts of the temple she spoke about this child of promise which had been sent from God to man. Mary never forgot the words of these dear old people concerning her wonderful child. She remembered, too, the story that the shepherds had told, about the angel's visit to them, and about their words and song. Always in the days that followed Mary thought about these strange things and wondered how her son Jesus would finally become the King and Savior of the world.